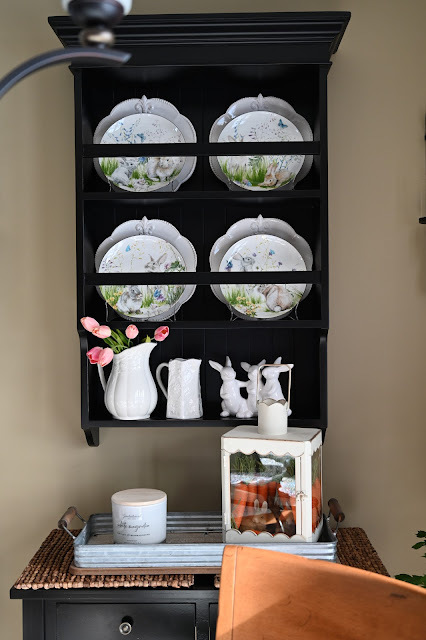 I decided to add some Spring and Easter decorating to my plate rack. The dishes came from Williams Sonoma last year. I love how they bunnies are munching their way through the new blooms! I loaded up this lantern with a whole bunch of carrots and mixed in some bunnies. They look like their enjoying themselves! While the sun was shining I grabbed a couple of shots of the entryway chest. I added some tall rose stems for a pop of color. So there you have my Spring and Easter decorating! It all looks so pretty Liz. Love the sweet little white trio of bunnies. The plates are so cute too. Isn't it fun decorating for Easter? Your bunnies are too cute munching in the lantern! Everything looks fresh and lovely, Liz. The bunnies in the lantern are surely happy! 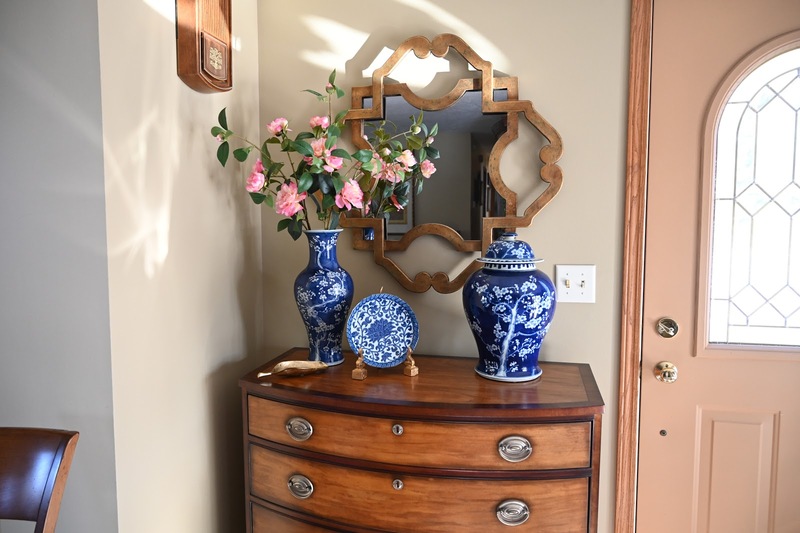 Your sunlight photo is especially pretty with your blue and white pieces. It is all very beautiful and a breath of fresh air to welcome in Spring. Happy Spring Liz! 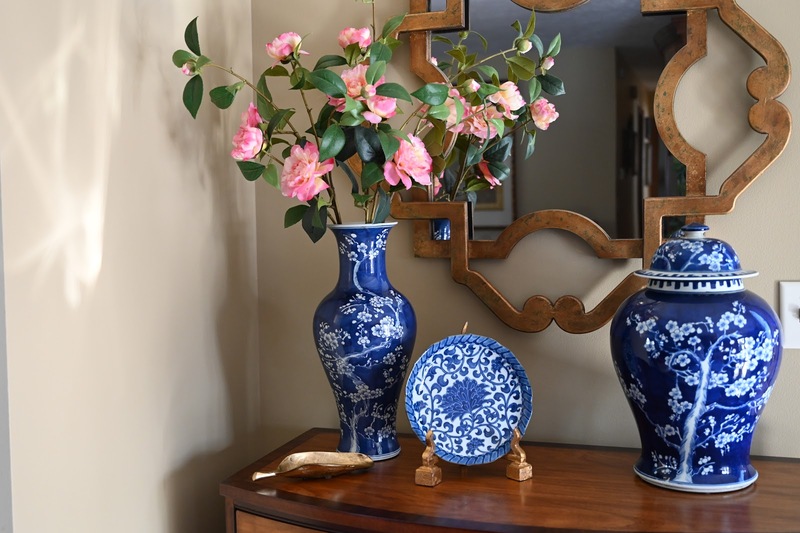 All your Spring decor is so pretty Liz. 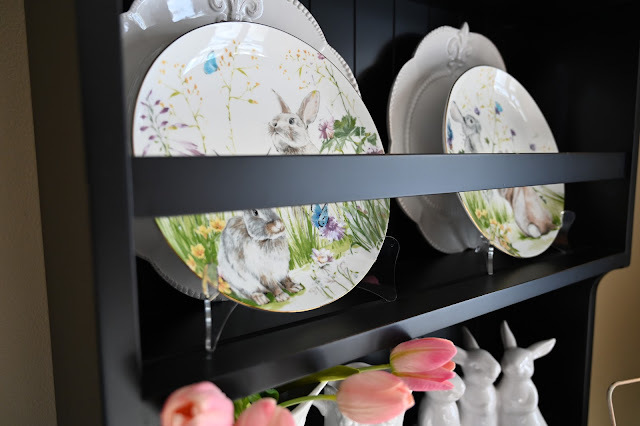 Your bunny collection of plates and rabbits is fabulous too ! 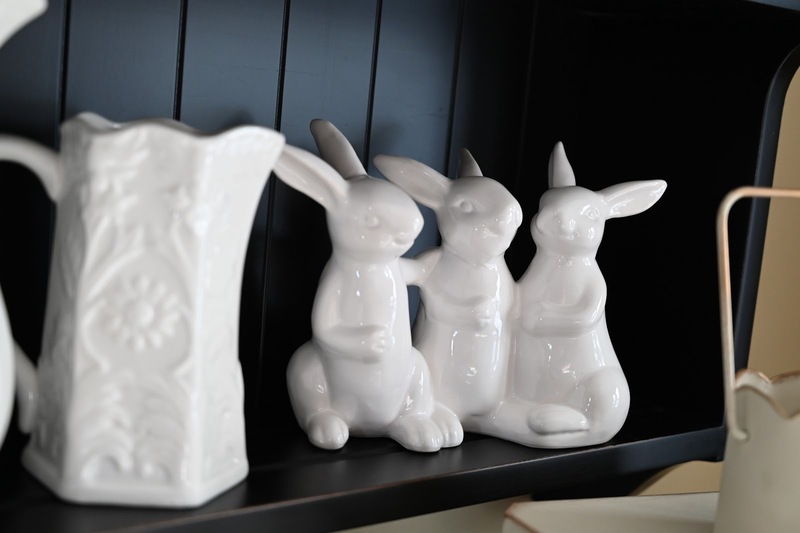 I adore the bunnies within your cabinet! A friend of mine has triplets. . .
making the three white bunnies together are so~o~o appealing! 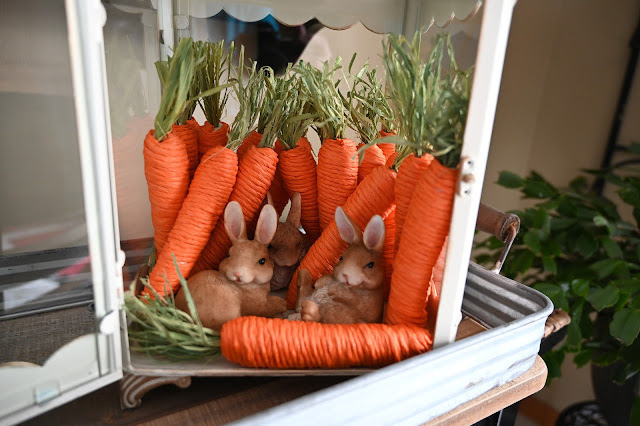 Adorable bunnies among the carrots in the lantern! 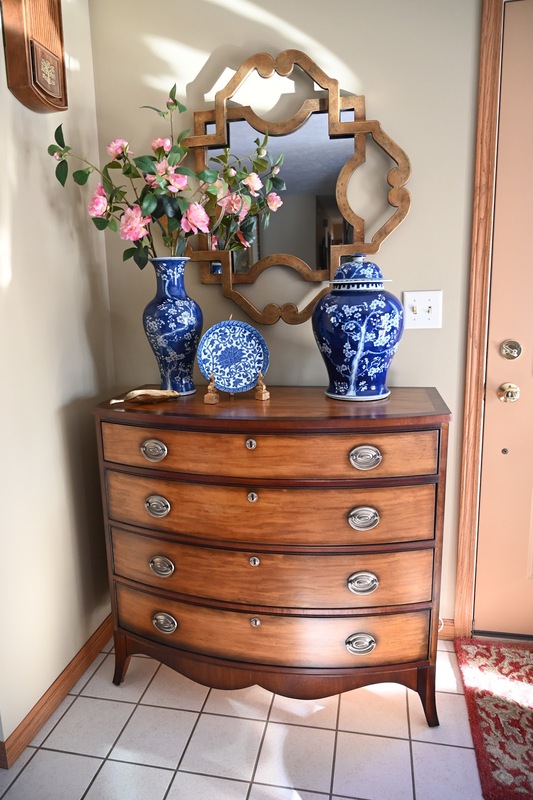 vignette of Timeless Classic design! 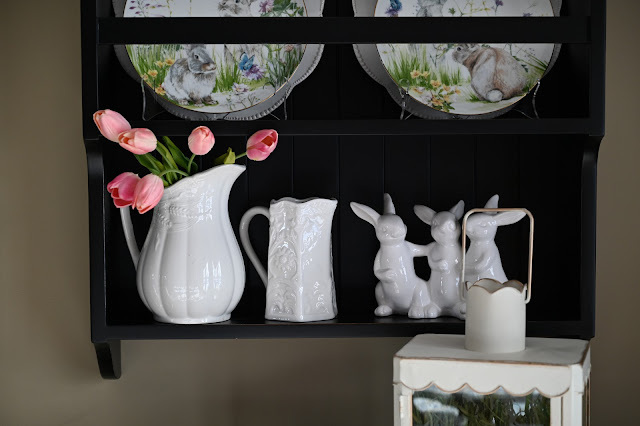 Lovely Spring and Easter decor! Your white bunnies are adorable and I love the plates! You remind me I need to bring up bunny dishes and all those lovely things. I nearly fell prey to some new plates in Home Goods yesterday -- and I might still! Bunnies make my heart sing! It all looks lovely, Liz. Love your Spring decor especially those sweet carrots in the lantern!! great idea!! Since i will be having my Knee Replacement surgery at the end of the month and can barely walk right now, i am not decorating for Easter this year but I sure do enjoy looking at other's Spring and Easter decorations!! Hi Liz, you have so many wonderful Easter decorations. I absolutely love those plates by Williams Sonoma!